With autumn coming, the fashion world is preparing to change with the season. The sheer and colorful outfits of summer will soon be replaced with warmer wardrobes. When it comes to fashion trends, men’s fashion evolves slower than women’s fashion does. However, it still carries with it some distinct changes. In general, fall trends for men tend to promote the classic and neutral colors of black, brown, and grey. But some blue, red or other brighter colors become a great accent to men’s style as well. Marc Jacob’s fall collection combines a red shirt with brown pants, a grey coat and a pair of black boots. Roberto Cavalli uses more khaki and brown in his fall collection. This autumn, you may want to go retro or turn to a military style — inspired by the early 20th Century military suits. Colors in the tones of navy and army green carry the theme very well, along with a pair of aviator boots. As a purposeful style, you can accompany the look with any type of pants. You can even combine your Army style with denim jeans. One thing to remember is that you should always go for darker colors. You can also look for a vintage military coat to support this fall trend. A burberry watch surely supports this look quite well. As for suits, the fall trend takes on the more classic cuts — moving away from the skinny suit, but not too loose-fitting either. 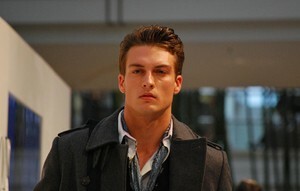 Go for the cut that promotes the masculine posture with broad shoulders, slim waist, and a pair of slim trousers. Double breasted suits are in again, with a slimmer appearance. For suits in general, you can select from 1 to 3 buttons. More buttons give the illusion of a taller and slimmer body. If you are not very tall, then you should avoid a single-buttoned suit, because you will definitely look shorter. If you happen to be tall, then opt for 1 or 2 buttons, but rarely 3. More than 3 buttons is simply not in the current trend. Besides the classic men’s suit fabrics of cotton and wool, the fall trend boldly introduces velvet. If you want to stand out, velvet is a good way to go! Select dark color shades. If a velvet suit is just too bold for you, then make a more delicate choice — such as a velvet lapel. Velvet lapels can give a suite a stylish touch. Velvet, in general, is quite trendy. For a more casual look, cardigans and sweaters are still in. In the end, it all goes back to how you wear the outfit. Even though the latest trend can become a guideline for you in terms of what to wear or what not to wear, you must also go with what makes you comfortable. That is the key if you want to look stylish without overdoing the look. Check out GQ’s list of fall trends that matter! Here are the 10 commandments of men’s fall fashion. Don’t miss Esquire’s guide to men’s fall trends without the fuss. Here are the top 5 men’s fashion trends for fall. Do you have these men’s fall wardrobe must-haves? For the scoop on accessories, here’s some men’s fall style advice.